I originally concieved of this project during my freshman year at the University of Virginia, in the middle of a working on a project to design power systems for sustainable housing being built in Haiti. While I was initially enthusiastic about the project, I realized quickly that the real problem facing the developing world was not a lack of sustainable energy projects, but rather a complete disreguard to economic and technical sustainability of projects. In short, most energy projects in developing countries break quickly and are never repaired. What was needed, I learned, was a power source that could either be fixed or built entirely by the people that would be utilizing it. Through two generous grants from the University of Virginia, I set off to acomplish this goal during the summer of 2011. 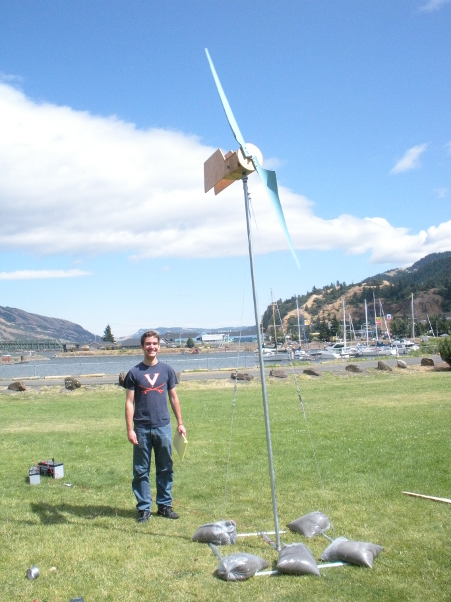 My plan was to design a micro wind turbine that could be built using nothing but hand tools, and did not need any machining, lathing, or components that were not easily available. While they're not perfect, and still in need of more testing, I hope you'll find that the designs on this website meet those criteria, and nearly match comercial alternatives in effectiveness.